This is a stand-alone app for Macintosh OSX computers (sorry, no Windows version exists) to demonstrate the K-means clustering algorithm on the Ruspini data set. Each run is seeded with k (user input) random initial points (or centroids). The closest points to each centroid are assigned to an associated cluster. Centroids of these clusters are then computed, and the closest points to each of these new centroids refines the cluster assignments. The process continues until there is no change, at which point k final clusters have been determined. Empty and singleton clusters are undesirable. So, when the process encounters a centroid that either defines an empty or singleton cluster, the program randomly moves the singular centroid to a different location before proceeding. A more complete and detailed description of K-means can be found in http://en.wikipedia.org/wiki/K-means_clustering. 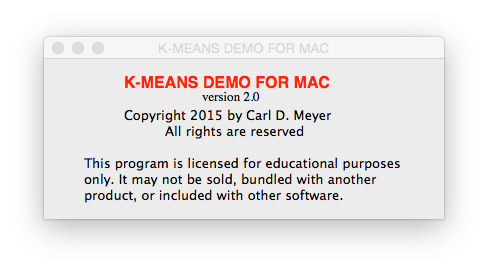 The file name containing the app is K-Means Demo For Mac. It is a compressed (zipped) file, and many browsers (e.g., Safari) automatically unzip it as part of the download. If your browser does not do this, then manually unzip the file simply by double clicking on it to create the .app file. Depending on the Security & Privacy settings in your SYSTEM PREFERENCES, your Mac may not open the file because it did not come from the Mac App Store. If you get such a message, then open SYSTEM PREFERENCES (under the Apple icon in the menu bar) and click on SECURITY & PRIVACY. Click the GENERAL tab, and then select the button in the lower portion of the window that allows apps not coming from the Mac App Store to be downloaded and opened. Start the app by double clicking on it, and look for the start-up window. If you do not see this window, then it is probably hiding behind other windows (like the browser window), so move or close the windows in your main viewing area. Click on (or close) the start-up window to start the app.